May the Fourth be with you… Get it? May the Fourth? I’m endlessly amused by wordplay and silly puns and Star Wars in general, so this whole celebration has been right up my alley. But hey, this blog is not about how much of a nerd I am, it’s about how infertile I am! While both of those things are rather pitiful, let’s get back to the topic at hand, shall we? Okay, so this month is obviously another natural cycle for me. No Clomid, no nothin’. Just man and wife, lying together in the biblical sense. Let’s hope we channel the Duggars and not Abraham and Sarah. I don’t expect much, but I am still hopeful. …I guess I have to be. I don’t really have a handmaiden to offer to the husband if my uterus doesn’t start working soon. Onto other topics, I’ve been reading up on ovarian cysts, and it sounds like they can either be no big deal, or a HUGE EFFING DEAL. So I called and made an appointment with Dr. Awesome to discuss my little cystic parasite. She can’t see me till May 16th, which is, oddly enough, one month before my appointment with the fertility clinic. Yay for irony! The cyst is still causing me some discomfort, and now that Aunt Flo is on her way out of town, I can feel a bit more tenderness in the area than before. Still with the pressure and strange bloated feeling in only one side of my abdomen, but more… twinginess than before. So that’s fun. I hope it doesn’t rupture. I don’t know if I’ve ever had a ruptured cyst before, but I know I’ve had a few strange occurrences over the years that sure felt like a piñata exploding inside of me… Repetition of said events would not be my preference. I’m thinking more and more that the new doc at the fertility center will want me to start right out of the gate with IUI. I’m hoping I can give at least one natural IUI cycle a shot before they start me on any medications, but we shall see. I sort of doubt there will be any more Clomid in my future now that I have this lovely cyst. I wonder if the last two medicated cycles are what caused it to show up at all…? Do other ovulation-inducing medications have the same effect on cyst growth? Is this just a random event, or should I get used to it? Dr. Awesome is accustomed to my endless barrage of questions, but I sure hope the fertility center doc is prepared for me. There are just too many variables. Too many things I don’t know. I must learn! I must know! And if you don’t tell me, I will Google! I should probably find a more sophisticated way to segue into this next topic, but I am tired and don’t feel like it. I can hear the husband slamming things around in the other room, which probably means that our Red Wings are not doing so well right now. Don’t you just love playoff hockey season? The anger! The competition! The beards! What’s not to love? I should probably go try to console him (as if he was the one playing tonight…). I hope you all had a lovely Star Wars Day, and I sincerely hope that your husbands’ favorite team won tonight. Ok since I recently had my own experience with ovarian cysts, I’ll give you my $.02 or$.03 about what I know. ~I read back a little through past posts and from what I can tell you haven’t previously had ultrasound monitoring with your clomid cycles. If this is correct, then unfortunately there’s no way to tell if the cyst was caused by the clomid, there before and aggravated by the drugs, or just something weird that’s popped up. ~My first clomid cycle gave me 2 cysts that because they didn’t clear up that cycle (& I didn’t get a BFP) I had a forced rest from meds the next cycle. I asked Dr M. if we’d be better with something like Femara and he said that there wasn’t evidence that one ovulation induction med was less likely to produce cysts than another. So the answer is yes all OI drugs have the potential for cysts which is part of why monitoring is important. ~Once this cyst clears up it doesn’t mean you’re perma-banned from Clomid. As I said before my 1st clomid round=2 cysts, 2nd clomid round=cyst free. Here’s hoping this cyst goes away like it came in, quiet and unnoticed. In the meantime I think a 20 kids and counting marathon is in need to help channel the Duggar fertility power. You are right–I had 2 Clomid cycles with my Ob-Gyn that were entirely unmonitored. She allowed me the 2 cycles only, in case my lining was thinned too much. I don’t remember her saying anything about cysts, but it makes sense now that I’ve been doing some reading about them. She did mention that if I had to move onto see the RE, that if they didn’t like the way the Clomid treated me I may have to take forced breaks from the meds also. Without monitoring though, I suppose it’s impossible to know anything! I was also wondering why you would want to try a natural cycle your first month out of the gate? 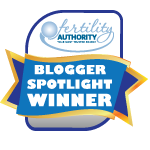 Your husband’s SA came back normal, so it’s not like you’re dealing with MFI where an IUI would make a huge difference. But maybe I’m just impatient (and my natural IUIs didn’t work). Obviously you need to hold fast to what YOU want to do and what you feel comfortable with. Thanks, friend. 🙂 I hope I’m not banned from meds altogether, but it sounds like that probably won’t be an issue. I responded really well to the Clomid! I was just thinking I might want to try a natural cycle first to see how it goes. I know you know that feeling. 😉 Then again, my ovulation seems to be rather weak on its own, so maybe medicated IUI’s will be best. I guess there’s no use speculating–Just have to wait for the RE to make the determination! I literally cannot wait for the testing to see what’s going on in there!